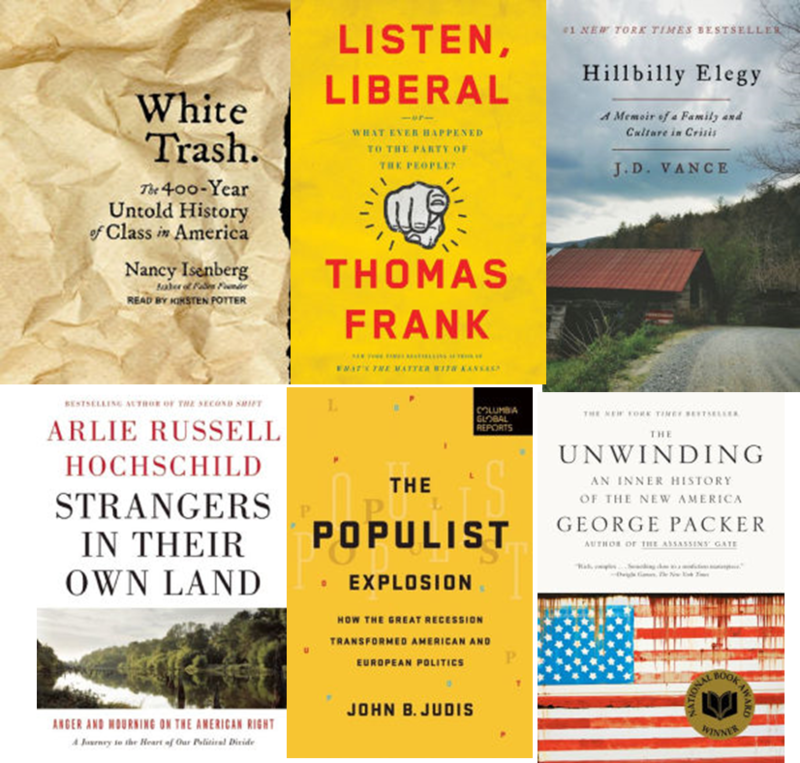 Shortly after Election Day, The New York Times published an article entitled "6 Books to Help Understand Trump’s Win". 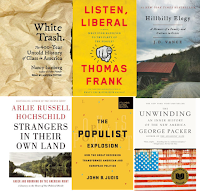 I'd recently read one of the books (Hillbilly Elegy) and added another (White Trash) to my wish list when I discovered Rachel's year-long readalong of all six. While I can't commit to them all, I am on board for the first. I'll borrow from the goodreads summary... it's long, but explains it better than I can. American democracy is beset by a sense of crisis. Seismic shifts during a single generation have created a country of winners and losers, allowing unprecedented freedom while rending the social contract, driving the political system to the verge of breakdown, and setting citizens adrift to find new paths forward. In The Unwinding, George Packer... tells the story of the United States over the past three decades in an utterly original way, with his characteristically sharp eye for detail and gift for weaving together complex narratives. I enjoy listening to nonfiction and borrowed this audiobook from my library via Overdrive. 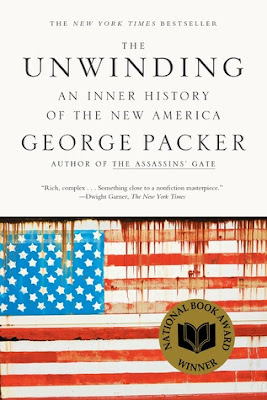 It begins with a short prologue (read by the author, the rest of the book is narrated by Robert Fass) which lays out his basic claim that the way of life we have known in America is "unwinding" before our eyes. Packer captured my attention with these few pages and I decided to purchase the ebook for a read/listen combination. As Part I begins we are introduced to several Americans, both private citizens and public figures. The section continues as a series of alternating biographies. Each one is interesting individually and, taken together, represent a broad cross-section of American life. The life stories Packer chooses to highlight illustrate geographic, economic, and racial diversity. He seems to be painting an overall picture of economic, social, and political instability. I'm not quite sure how this book might increase my understanding of Trump's victory, or even how these personal stories connect to prove the author's thesis, but it certainly makes for interesting reading. I'm curious to see what Parts II and III hold. I just put this audiobook on hold at the library...wish I'd done it in time for the readalong! But, I'm #1 on the waiting list, so maybe I'll get it in time for parts 2 and 3. Sarah - Sounds like your wait should't be too long. I'll probably do one more post when I finish... chapters about Oprah, Raymond Chandler, Newt Gingrich, Sam Walton, and even Jay-Z add interest, but I still can't see how he'll tie it all together. Because I enjoyed Hillbilly Elegy SO MUCH, I think I'd better pick up a copy of this one, too. Thanks so much for sharing your early thoughts, JoAnn; excited to continue following along! Tara - Hillbilly Elegy was so good... a little strange for me finishing the book early on Election Day and then seeing the author as one of ABC's analysts that night! Can't wait to see how the author will tie all the stories in The Unwinding together. Susan - After watching the evening news tonight, I'm contemplating a new career as an activist (ha!) ... it's only been a few days, but I can't take much more. Hmmm....I'll watch for your review of this one. Sounds very interesting and like one that might work well for me too on audio. Kay - It seems strange that I'm enjoying this so much without being able to see how (or if?) he'll pull it together to make the point. That is a great idea of a readalong. I'm really curious to hear how the rest of the book works out for you. It definitely sounds very interesting. Iliana - I'm curious to see how he'll wrap it up. It's so interesting, but I can't see how it all comes together to make his point. I definitely don't read enough about current events but this kind of story-telling approach appeals to me and might change that! I will make this brief, but even the NYT never fails to blow my mind on how rude, and one sided they can be. I voted for Trump because things need a big kick in the pants, and that's the only way it could happen. Liberal handouts cannot be sustained, and it is not the government's purpose. Ask the man who spoke at the Clinton convention about the Constitution. Oh, and I am from a family of small, and medium sized business owners, and am neither a Hillbilly, or White trash. How incredibly insulting, and hurtful. If only I could have a conversation with a liberal who could discuss their position rationally! I welcome that, if you are interested. Jan - This is a book blog and my purpose here is to discuss books, not politics. 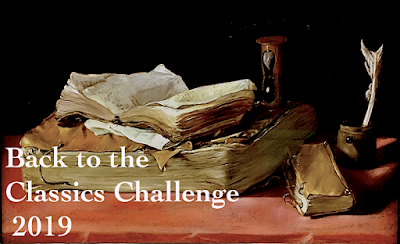 In this post I talk about my initial impressions of a book I am currently reading, mentioned a book I have read, and noted one I might like to read. I have never talked about my political affiliation (which might surprise you) and do not intend to do so here. 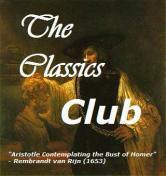 Commentary on the book is welcome. I really like this idea for a readalong. I know I read Hillbilly Elegy right before the election and I truly did feel like Vance's book explained a lot about the election results. (Though that certainly wasn't his purpose.) I've recommended it to so many people! Susie - I think the timing of Vance's book worked out better than he could have predicted... it's certainly helped sales! Thanks for a great review of what sounds like a valiant attempt to make the state of our country more understandable. JaneGS - Hoping to have more coherent thoughts by the time I finish... hopefully within the next few days. Such an interesting concept for a read along! I hope you enjoy it. The entire event is baffling! It is certainly a tumultuous time right now in america- and I think a lot of us are struggling to make sense of it. I hope you enjoy this book and that it helps! Greg - I'm still not sure how much the booked helped, but it was a fascinating read. I remember that NYT list and wanted to read many of those books too. Love the structure of this one - I am a fan of nonfiction books from the perspective of actual people. They make for more interesting reading. 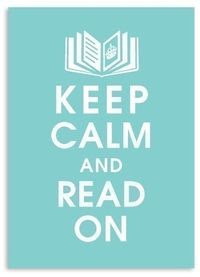 I will have to read this one, but maybe not this month. Athira - I completely agree about the structure and thoroughly enjoyed this book! The audio version is very good, too... perfect for a read/listen combo.